Twitter Shmitter – it’s all about iGoogle Showcase now, phools! Today Google announced their new iGoogle Showcase which allows us to see and share the homepages of some of our favorite celebrities including Keith Urban, Betsy Johnson and Dave Matthews. The iGoogle Showcase allows you to either add a celebrity’s entire iGoogle page to your own, or browse through the collection and choose different gadgets and themes from several pages. For example, you might select Al Gore’s iGoogle page for his preferred theme and gadgets for keeping up on the latest media news, supporting the Alliance for Climate protection cause or browsing through photos from National Geographic. In addition, many of our celebrity partners have created their own custom iGoogle gadgets to easily connect with their fans every day. If you’re a Ryan Seacrest fan, his new gadget can help you keep up with all the latest entertainment news. You can follow his tweets, watch exclusive videos, listen to radio interviews, and view his photo albums. Donald Trump offers advice to entrepreneurs, Martha Stewart shares recipes and tips, and Anderson Cooper delivers headline news and extras from his CNN show AC360. 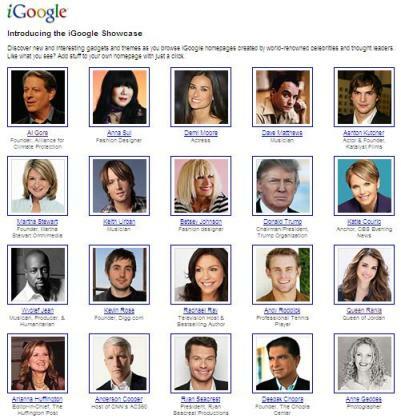 To get any one of our celebrity themes or gadgets on your own iGoogle page, visit the iGoogle Showcase. We’ve all heard about “six degrees of separation,” but now, some of your favorite stars are just a few clicks away. So what do you think? Is iGoogle gonna out celebrity Twitter? 50 queries in 0.693 seconds.